Fully furnished, and equipped, spacious chalet. Home from home holidays for multi-activity groups and families. 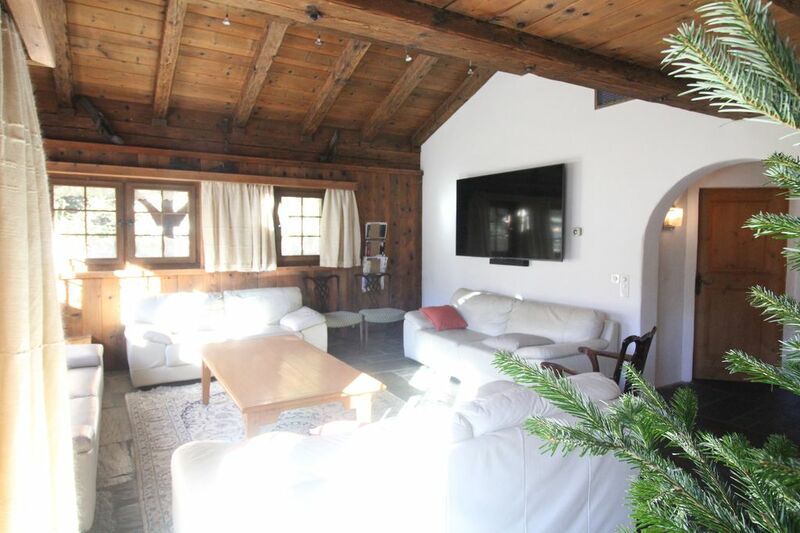 Relax in a traditional chalet ambiance, with modern facilities & spacious layout. Chalet Runca comfortably sleeps two to three families in six bedrooms on the top, first and ground floor. The first floor is mainly for socialising with heated stone floors, high ceiling living room with mountain views, log fires, leather sofas, opening out onto a large balcony. A kingsize bedroom has mountain views with use of the first floor wc/shower room. As well as the large kitchen with octagonal breakfast table, there is also an oak dining table area, seating twelve. The Sauna, Steam Room, Drying Room, Ski Room, Wide Entrance Hallway add to the space of the whole chalet which enjoys its own garden and is a few steps from the free resort bus, only a few minutes from ski lifts & town. Self catering chalet guests enjoy exclusive use of the three floors using its own private entrance. We meet you at Arosa station, provide a welcome brief, clear the snow, do general maintenance and offer in-house ski hire and ski tuition. Guests can request us for Private or Group English Speaking Ski Lessons. Arosa is a traditional Swiss ski resort with a history of above average snow quality and long sunshine hours. It is at 1,800 metres in a bowl at the end of the stunning Schanfigg Valley, amidst wildlife, forests, rivers and mountains, and has an unusually good snow record. The ski slopes are wide and sunny, and the Hörnli (Arosa) now links to Urdenfürggli (Lenzerheide) each at 2,600 metres providing 225km quality linked skiing. The slopes are wide and sunny, where fourteen lifts serve 44 miles of mainly blue and red runs, spreading wide out among three peaks: Hörnli, Weisshorn and Bruggerhorn. The Hörnli (Arosa) now links to Urdenfürggli (Lenzerheide) each at 2,600 metres. The construction was used to take account of the concerns of the environmental organisations to generate the minimum impact on the Valley. Aside from its historic background and traditional ambience, Arosa has become quite a big attraction for snowboarders, with it's own Olympian, Emilia Ambuhl. Arosa offers alpine skiing, cross-country skiing, snowboarding, telemark skiing, snow-shoe excursions, open air ice skating, three frozen lakes, mountain train rides, toboggan routes, forest walks & endless heavenly running trails, shops, bars, night clubs, cinema, and good choice of restaurants for every budget. Not only skiers can enjoy Arosa's excellent amenities and transport network, non skiers have plenty to do, such as forest walks, toboggan runs, open air ice skating, spas, shops, tea rooms, knitting cafes, and sports bars. With horse trails crossing over ski trails, crossing over walking trails, crossing over rail trails, crossing over toboggan trails, crossing over cross country trails, crossing over snow shoe trails, it is just as easy to be part of the winter scene as it is to be remote in nature. You’ll easily forget car life at home when you meet up with the whole group on the mountain for lunch. You walk out of Chalet Runca to well signposted forest, lake and mountain trails, which also double up as running trails for all levels of fitness. Restaurants, Bars, Clubs & Tea Rooms. Whatever the activity, your group can meet for lunch at an excellent choice of mountain restaurants, all accessible by walking trail, hop on/hop off resort bus, or ski/pedestrian lift. There is a vibrant 'nightlife' in Arosa, accessible by lit up footpaths, so if there are members of the party with more energy than the rest, this may be the icing on the cake. Celebrating one hundred years of railway access, Arosa has hourly departures to Zurich International Airport, via Chur, the oldest city in Switzerland. Rail travel is the most popular method of travel to Arosa as this avoids 365 road curves between Chur & Arosa. If driving to Arosa is the preferred option, the road is excellent, remembering to allow an hour from Chur, & to be equipped with chains for the last twelve kilometres from Langwies. The Arosa public transport is most convenient & getting around resort by foot or toboggan is easy. We provide garaged parking subject to availability, and there is covered & open air parking in resort. We live and work in Arosa and our children attend the local school. A wonderful place to live, you are close to the bus-stop and town amenities. The fixtures and fittings are of high quality, the new eco-heating system creates a very cosy atmosphere, with underfloor heating throughout. The location is sunny and enjoys mountain views. The rooms are spacious with good quality beds, mattresses and linen. The balcony and terraces give plenty of living space, garaged electric car charging, sauna, steam room, power showers, large sociable kitchen, light spacious living room, and comfortable bedrooms. High-speed wifi. spacious and light with sunny aspect and mountain views, log fire and pleasant balcony. 75" Flat screen with Netflix, DVD, Youtube, Cable TV. We had I nice stay in the Charlet for a week. Plenty of room for the hole Family with my children and grandchildren. It is a lovely house for a Family visit. Many thanks for recording your stay and we wish you all the best.